Anime Festival Asia (AFA) has been running for 5 years, and each year it just gets bigger and bigger. This year, there was the introduction of AFA Malaysia and AFA Indonesia; both were wildly successful and made me wonder if the AFA Singapore would suffer in quality due to lack of resources or time for planning. Fortunately that was not the case. They just had to make one announcement to alleviate all my doubts; Sphere. An extremely popular idol/seiyuu group with rabid fans from around the world, this was definitely AFA's biggest catch so far. And that was not all. Kishio Daisuke and Terakawa Aimi came over with Horipro and Bushiroad respectively, both of them being very respectable seiyuu and singers as well. For the I Love Anisong concerts, despite the technical difficulties during the 2nd night's concert, I've heard really positive comments. The acts were diverse and impressive, easily the best line-up outside of Japan. Cosplay this year also took a step up by inviting this years WCS first (Japan) and third (Indonesia) place winners to judge the competition. Second place winners? That would be our very own local Singaporean team! Besides the WCS winners, there were also some other guest cosplayers from China and around the region, and of course the returning favourite KANAME. The Cool Japan Forum did not return this year, but the benefit of that was that we get to hear the talks and see the guests in the main AFA Festival area. It also meant two legendary directors, Watanabe Shinichirou (Cowboy Bebop, Sakamichi no Apollon) and Kamiyama Kenji (Ghost in the Shell, Eden of the East) had stage events too. Oh, and Watanabe-san announced that the sci-fi anime he is working on with BONES will be broadcast in 2013. 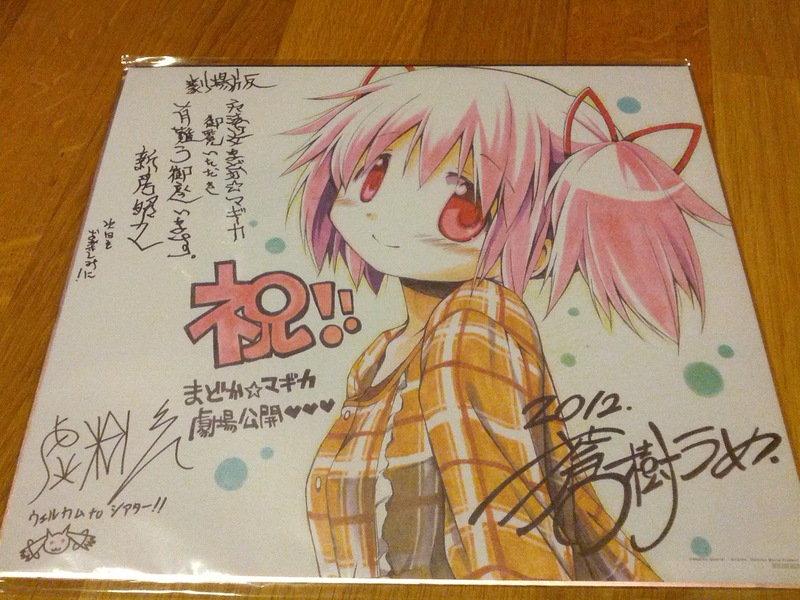 When Danny Choo said "Watanabe-san will be holding an autograph session somewhere, sometime later. Just stalk him and you'll find it." I tried scouting the huge festival hall but couldn't find any indication of where it would be. Some time later, I was hanging out with my friend, sipping on the free coffee provided by Nescafe, and thought I heard someone mention "Shinichirou" at the Horipro booth. Went there and realised I heard wrongly! But wait! I spotted Watanabe Shinichirou walking nearby and immediately started stalking him until he stopped by a booth, sat down, and started the autograph session! I was so nervous, forgot all the Japanese I've learnt, but still managed to get his signature and asked him to take a photo with me! In terms of movies, last year had Naruto, FMA, and Haruhi, the first 2 being put behind exclusive paid screenings while Haruhi was screened for anyone with Stage tickets. This year, they did the right thing by giving us Naruto and Fairy Tail on Stage, and the Madoka Movies as exclusive screenings. It felt more right this way. 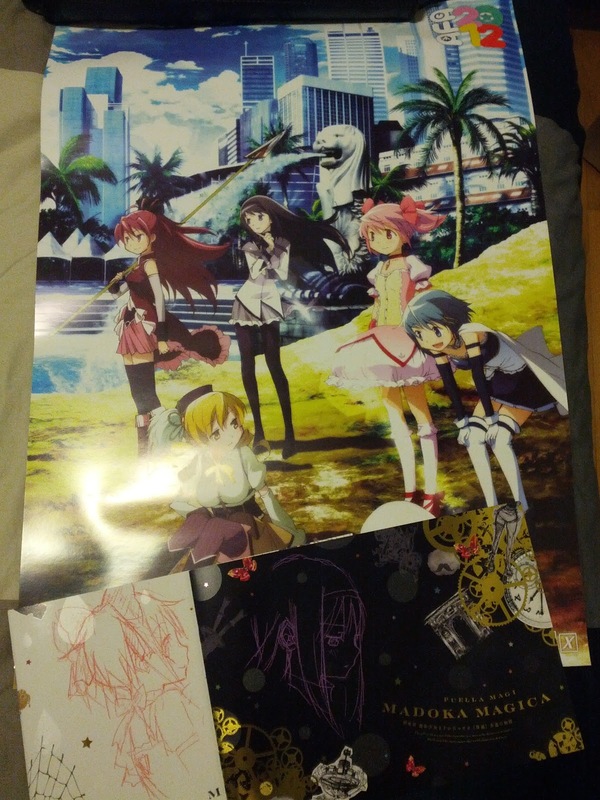 Also, everyone overseas was jealous of the goodies the Madoka-movie-watchers got. Above is a replica of a signed 'shiki'. 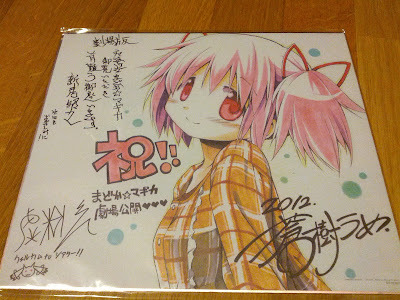 Illustration by Aoki Ume, signed by Aoki Ume (character design), Urobuchi Gen (writer), and Shinbou Akiyuki (director)! The image below that shows the Singapore-exclusive movie promotional poster (Merlion in the background of this Singapore edition lol) and the 2 movie programme booklets. Pretty awesome set of freebies! This year's AFA was without a doubt bigger and better. But as always, there is room for improvement. Here is a run down of some of the good and bad points, as well as some suggestions (i.e. my wish list). Festival area was huge and event guide did not help with that. 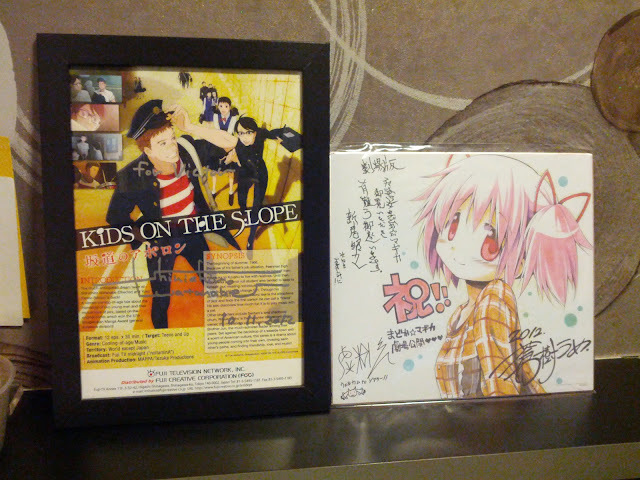 A lot of events at mini-stages and various booths and signings and meet-and-greet and... tons of stuff. Needs a better event guide! Marketing and promotional efforts should have started earlier for AFA Singapore so as to highlight all the awesome stuff. The mini-performances in the stage area by May'n, Aimi, and Kishio Daisuke were great but would have been better if those were noted in the event guide. Bring more male seiyuus. Kishio Daisuke had a good reception this year, and it has been the female seiyuus headlining AFA every year for 5 years now! Bring Hanazawa Kana, as hinted by the Editor of LisAni during the stage event. Hanazawa X Yui yuri moments imminent. p.s. Visit my YouTube channel here or view my AFA 2012 playlist here for video clips from the nico livestream booth in AFA!